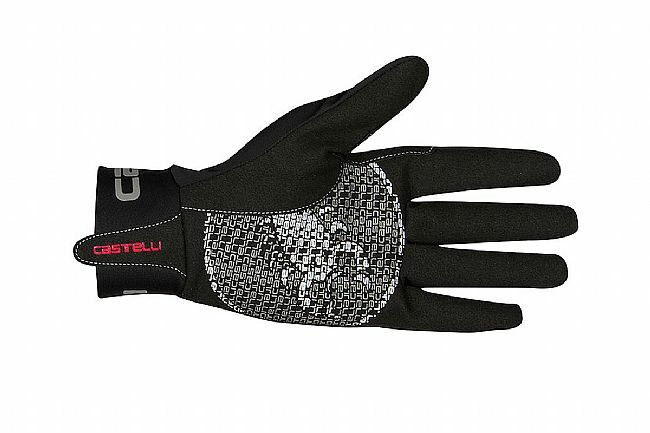 The Men’s Lightness Glove from Castelli provides stretch, comfort, and warmth thanks to a combination of the right materials and clever construction. For digit and draft protection, these gloves are full-fingered with a semi-elongated cuff that extends just past the wrist. For stretch and warmth, these gloves are primarily made of Castelli’s Thermoflex, a malleable, plush, and insulating material. The stretch properties promote a comfortable yet aero fit while the plush interior generates insulation by trapping a layer of warm air against the skin. The palms showcase Castelli’s Clarino™, a synthetic leather-like material with a tacky texture. Arranged across the palms in an eye-catching design, Clarino™ provides the right amount of grip for safe and controlled handling. First, the fit. Castelli gear are notoriously small, and these are no exception. All my other gloves are small, and these are medium , and I could have gone with large. The wrist collar is so tight and inflexible that they are difficult to put on, harder to take off, and if you take them off mid-ride, nearly impossible to put back on. But once on... Castelli says 55 F - 5. I think theyre fine down to 45, but any colder, no. In the 40s, be prepared to have cold fingers descending, and maybe if youre cruising at 20 or more, but other times you will be warm. I think they are versatile enough to go up toward 60, but theyll be warm. The good news there is that they wick moisture pretty well. The snug fit and material give you excellent feedback, and they are very grippy. Once they warm up on the ride, they do an excellent job on touch screens. They are better in wet weather than Castelli says, but not quite as warm as in dry. 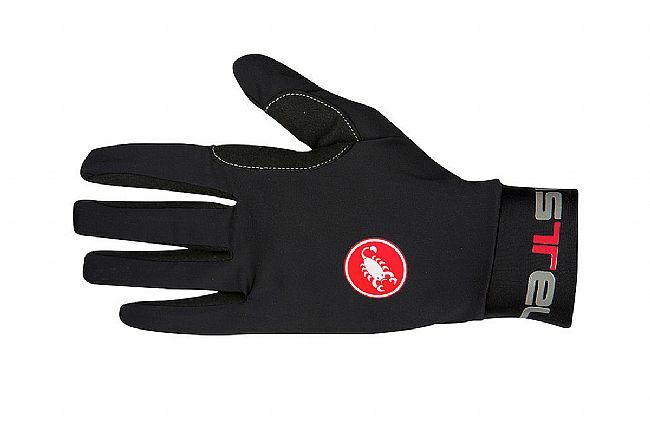 Excellent gloves (but cmon Castelli, make stuff easier to get on and off!). Nice lightweight glove with dexterity and grip. My hands measured as a medium and sized up to a large and is still a snug fit. Very comfortable, and warm, as advertised. Took off one star because not touch screen friendly. No other issues. The gloves work great for my rides in the upper 40's. Don't think I would use them in anything colder than that. I like the feel of the gloves, they are comfortable and gave me a good grip and feel for my brakes. The only downside is the wrist is so tight that it's super difficult to take off. I ripped a seam slightly trying to take my gloves off at a cafe stop. I am a fairly lean and not at all a heavy set person. Gloves would be perfect if it weren't for the difficulty of removing them. Keep my hands comfortable without andy bulk. These gloves are very comfortable and effective in the temperature range of 45 to 60 fahrenheit. These gloves are perfect for the mild cyclocross weather here in California! Picked up a pair of these while on sale, glad I did! Have been wearing them all through winter and they have not failed me yet. Temps have dropped into the high 30s and these gloves hold up! Comfortable, stylish and work better than expected.. No complaints. castelli glove are great !! Simple fit nicely made .!! I went on cooler morning ride !! 49 degrees the gloves worked fantastic !! My hands were warm .easy to move !I was glad that i purchase these glove !! These gloves are great for autumn and spring riding when the temps are not low enough to require a winter glove, but not warm enough for bare hands. I use them on dry rides for temps 8-14 Celsius. They are nice option to something like the Defeet Wool Duraglove, which also fit in the same temperature range but IMO they stretch out and eventually tear too soon. The Castelli Lightness holds its shape better, but they are not the most durable either. I shredded the palm when I stupidly wiped a tire with the glove on. I'll knock off a star because I felt they should have survived that, but they are good enough that I bought a replacement pair. This is a well designed pair of gloves that works well to keep cooler fall temperatures at bay. Ive used them in the high 40s, but anything cooler leaves your fingers a bit frosty. The grip is secure and its easy to brake and shift with them on. Love these gloves when the temp is too cool for fingerless but not really cold. They do fit snuggly so are a little difficult to get on and off. I like the fit and its warm enough with temps in the 40s without wearing liners. Great for morning rides when the temps are in the 40s-50s(F). Fit is snug, you might want to order one size larger than measurements call for.